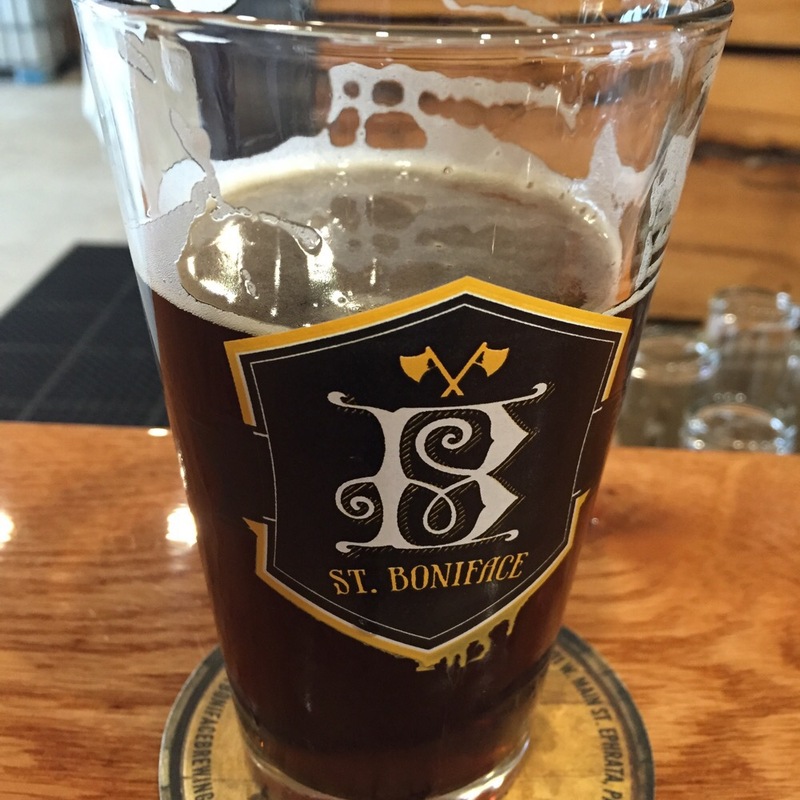 St. Boniface Craft Brewing Co. in Ephrata, PA is a small brewery doing big things for Lancaster area beer. I had the chance to swing by their establishment recently and was incredibly impressed in the quality of their beer. As a product of a lifetime of Catholic education the wink and nods to the namesake in the brewery were also appreciated and inviting. My first pint was their Offering #22 Berlinger Weisse. This refreshing light bodied beer was effervescent and inviting and perfect for the season. With a mild flavor and subtle hints of salt and coriander highlighting citrus notes it was exceedingly drinkable. Good thing this one comes in at only 3.0% ABV because it absolutely disappears from the glass quickly. The finish is dry and a little acidic and asks for you take another long draw from this fantastic beer. This straw yellow cloudy beer with a light fluffy head was so good I nearly hesitated to try the other offerings. The Bullshead Mild is an amazing example of a English style mild pub ale. Malty flavors that sit on top of roasted bready yeast like accents, this beer is easy drinking but big on flavor. While the Weisse gently made for an inviting beer this one is bolder but no less drinkable. 3.2% ABV but loaded with malts and a sweet finish make this the perfect beer for a long day drinking beers with friends. When beer is described as “liquid bread” they mean ales like this one. 3lbs IPA is properly bitter slightly hazy ale with pine and resin flavor right up front but not overly so in the nose. Well balanced with a backbone of malts and some citrus hops acting their proper role. Medium bodied and well developed. This is a good example of an inviting IPA that at 6.0% doesn’t try to blow your socks off with bombed out hops but seeks the balanced end of the IPA scale. The real discovery was Paideia Pale Ale. This brew was in and of itself worth the trip. The golden ale presented with a thick white head of foam that held up and laced the glass perfectly. Clementines and nectaries in the nose along with some malt to show the impending balance of flavor. This beer was high on tropical fruits and tasted like the fruits in the nose. Exceedingly drinkable it is also available in cans which I got to go. Paideia referred to the greek ideal of the perfect citizen. The name is a lot to live up to and in this case it does. If you have not visited St. Boniface you are really missing out. The beers are well crafted and the overwhelming distinction from other craft brewers in the area is just how eminently drinkable these beers are. Relatively low ABVs across the board and big flavor make for a great day of tasting beers. St. Boniface was a missionary to the Germans and is credited with being a unifier of Europe. Not a small credit in any sense. Likewise, the brewers at St. Boniface are the unifiers of Lancaster beer. They are brewing easy drinking approachable beers that will cut across the beer drinker spectrum. Craft beer novices and the pickiest of beer snobs will enjoy their offerings and be able to sample both generously and happily. Posted in Berlinger Weisse, Easy Drinking, IPA, Lancaster Beer, Low ABV, Mild, Pale Ale, Pub Mild, Sour Beer, St. Boniface Craft Brewing Co.